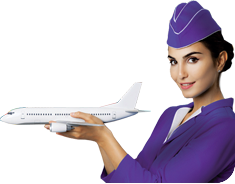 This course prepares you for careers in aviation, tourism & hospitality industry. With the increasing need for customized travel packages and hospitality services, career opportunities for skilled professionals in aviation, hospitality & tourism industries are at all-time rise. On successfully completing this course, you can work for top airports or airlines, hotels & resorts or travel companies. This course provides professional learning opportunities by combining classroom lessons and practical learning sessions. You will also get trained in all aspects of aviation management - starting from in-flight experience to ground handling, cargo & load management, people & resource management at the airport, to calculating fares and issuing tickets. You will also receive in-depth training in all aspects of hospitality management including guest services, reservation desk management, housekeeping management, F&B services and accounting. With practical training in tourism travel & tour operations and travel desk management, you would be ready to join top travel companies at lucrative job profiles. Along with the technical skills, you would also be trained in English communication & presentation skills. This will not only give you a competitive edge over your peers in the recruitment process as well as your work-related communication. The aviation industry is not just about being a pilot or an airhostess. Airport management is a huge responsibility that ensures safe and smooth transportation of passengers, goods and cargo. As an airport management professional, you get great career opportunities at domestic and international airports and various airlines. Professionals in hotels and hospitality are in demand in all parts of the world. You can work in a hotel, a cruise ship, vacation resorts, industrial catering, and other similar segments. Tourism is promoted by both, private organisations and the government, as it contributes to the GDP of the country. There is good demand for professionals with the right skills here.